Bayern Munich coach Louis van Gaal will leave the German club by mutual consent at the end of the season, one year before his contract was due to expire. 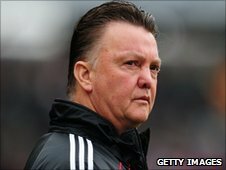 Van Gaal, 59, won the double in his first season at Bayern and reached the Champions League final in 2010. Bayern remain in the Champions League but are fifth in the Bundesliga and were knocked out of the German Cup. "The reason is differing views on the club's strategic direction," the club said in a statement. The Dutchman's position at Bayern has been under scrutiny after a loss to Hannover at the weekend, which followed a league defeat by Borussia Dortmund and the German Cup semi-final loss to Schalke. In a rerun of last year's Champions League final, Bayern led Inter Milan 1-0 after the first leg of their last-16 clash with the second leg due to take place in at the Allianz Arena on 15 March. But the club's board met with former Barcelona boss Van Gaal on Monday morning and appear to have come to a mutual decision to part company.